Unfortunately it's been two incompatibilities in two weeks for ICeCoffEE—discontiguous selection (command-drag) in NSTextView, which is new in Tiger, is broken with ICeCoffEE installed. I’ll get to work on it this weekend. Otherwise, Tiger is great except for the impossibly broken Find/Spotlight UI. One thing John Siracusa didn’t mention was Apple’s inexplicable replacement of a great, resizable path widget with one that is no longer resizable, and expands when you mouse over a given folder. Of course, the new version doesn't let you easily see deeply nested paths to multiple folders by just using the arrow keys on find results, which I’ve done since Find File in System 7.5. 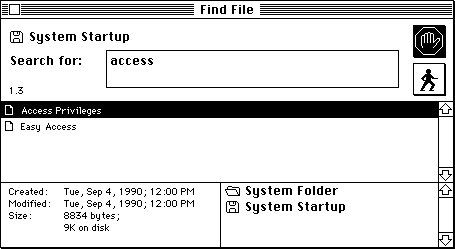 Maybe it’s the new retro thing: you couldn't resize the Find File DA window in System 6, either. Also note the great display of file information in System 6. Instead, to see more information in Spotlight, you have to click the almost-invisible little "i" widgets...once for each search result. 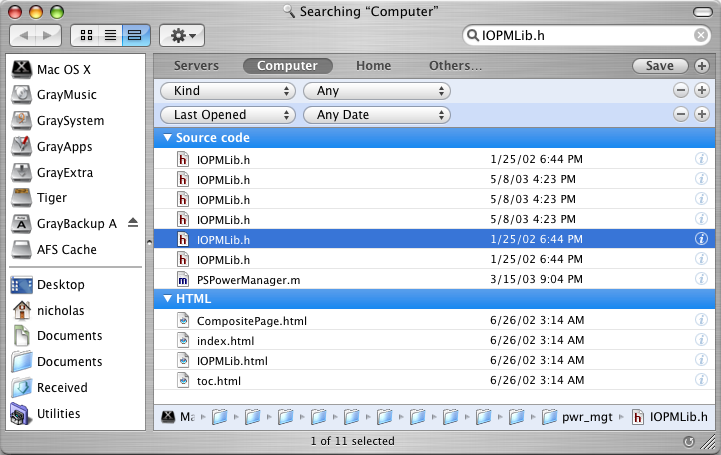 Or option-click the "i" and watch as one category of search results expands to fill several screens in space-wasting manner, or use the Inspector window if you're lucky enough to be using the Finder’s variant of Spotlight. Progress! Computer architecture, medicine, usability, Mac OS X, Python, Cocoa and hiptop development, and my life.